BB-8 is under your control! Looks and acts just like the astromech droid in Star Wars: The Last Jedi! The RC remote lets you take command of the action. Features movie-accurate lights and sounds. His head moves in any direction - back, front, and side-to-side. Recreate favorite moments or new adventures with this fun robot! Imagine BB-8 in another dire situation, heroically speeding into action to save Poe Dameron. Then act it out with this awesome Star Wars: The Last Jedi Remote Control BB-8 Droid that looks just like the astromech droid in The Last Jedi but features an RC remote that lets you take total command of the action! Move BB-8 in any direction to evade villains, or sweep him along to someone's rescue. With friends or on your own, recreate favorite moments or new adventures with this fun robot! 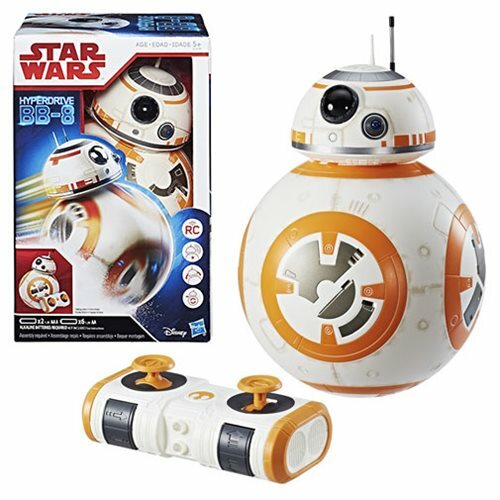 Includes BB-8 body, BB-8 head, remote control, and instructions. Some assembly required. Requires 4x 1.5V "AA" and 2x 1.5V "AAA" alkaline batteries, not included. Ages 5 and up. This remote-controlled Hyperdrive BB-8 rolls in any direction and makes expressive droid sounds as kids lead him into adventure at accelerated speeds. Control the action with remote-controlled accelerometer technology, and watch as BB-8 lights up and his head moves in any direction - back, front, and side-to-side. - Movie-accurate appearance and lights. - Head moves front, back, and side-to-side while accelerating quickly across surfaces. - Makes expressive droid sounds and lights up. - Remote-controlled accelerometer allows rolling in any direction. - Recreate adventures and scenes from the Star Wars universe! Enter the world of Star Wars and launch into action and adventure! Discover a galaxy of starships and vehicles, and get immersed in exciting stories of good versus evil against a backdrop of a universe populated by heroes, villains, droids, and space creatures. With the Star Wars: The Last Jedi Remote Control BB-8 Droid, kids can imagine the brave and loyal BB-8 rolling into action!